The flagship of the Quest model rocket line! We've been improving this rocket design for twenty years! 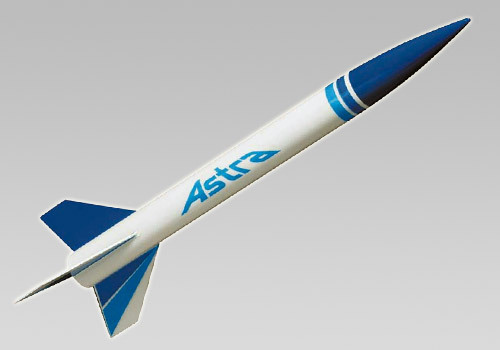 The Quest Astra is one of the most widely used model rocket kits we offer and features Quest's TTW - Through-The-Wall - balsa fin design. Through-The-Wall fin attachment makes building so much easier. It really helps you glue the rocket fins on straight and in the correct position. Also included is a simple paper cradle to hold the rocket during assembly. Includes color coded parts to make identification for assembly easier. Uses a Kevlar shock cord that is anchored right to the engine mount for reliable recovery. The 14 inch parachute is already cut-out and the shroud lines are cut to length (these features give you the benefit of a more successful building experience). No other manufacturer offers all these great features for such a low price!